I’ve updated the Quantifiable Edges Big Time Swing System overview page with results through December 28th. There is not a SPY trade currently open and based on the current market setup there is no chance of a trade triggering before year-end. 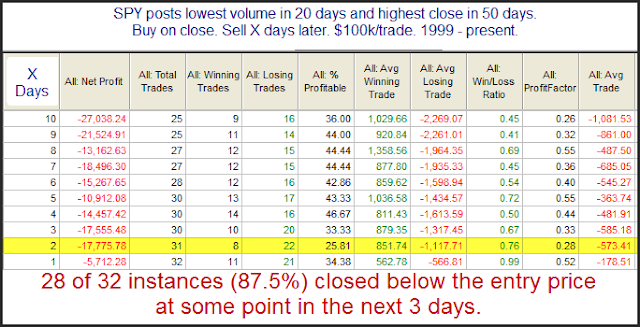 I don’t update results that often since the system only trades about once per month on average. 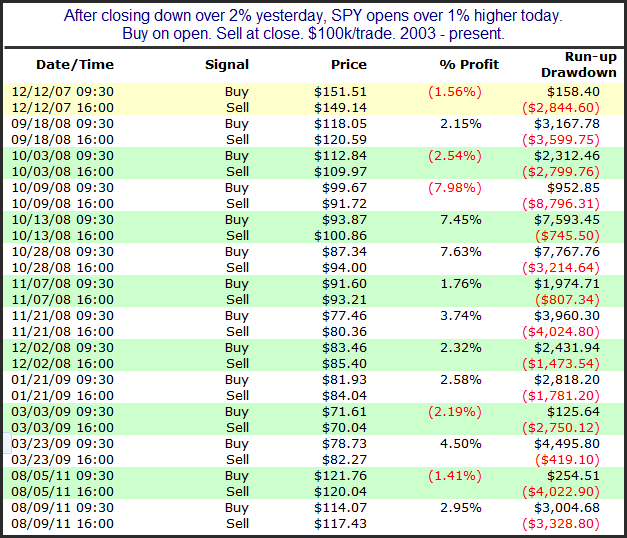 The 2nd half of 2011 was a somewhat difficult period for those using the system to trade SPY. In August SPY suffered the worst losing trade in its history after it triggered long shortly before the US debt downgrade and market collapse. This 1 trade alone was responsible for an 8.26% loss. But even with the loss the Quantifiable Edges Big Time Swing System managed to finish the year with a small 0.25% gain for SPY traders (including dividends, commissions, interest, and compounding assumptions). This was certainly disappointing but in a tough year for the market, and with the SPY suffering it’s worst drawdown ever, it was nice to be able to finish in the black. Traders who used the standard parameters and traded any of the other 29 ETFs that I discussed in the manual and have tracked for the last several years likely made out much better than this. 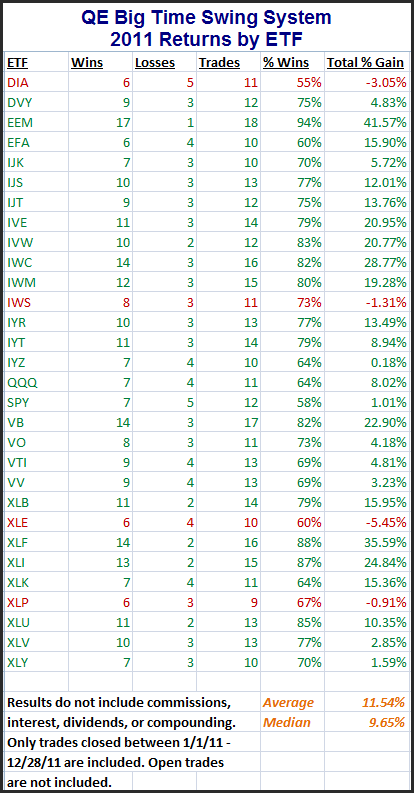 Including SPY, the average return of the 30 ETFs was 11.54% and the median was 9.65%% (see assumptions in table). If you want to see stats for the full history of the 30 ETFs, that can be found on the Quantifiable Edges Big Time Swing overview page. I have listed 2011 trading results for all 30 ETFs in the table below. 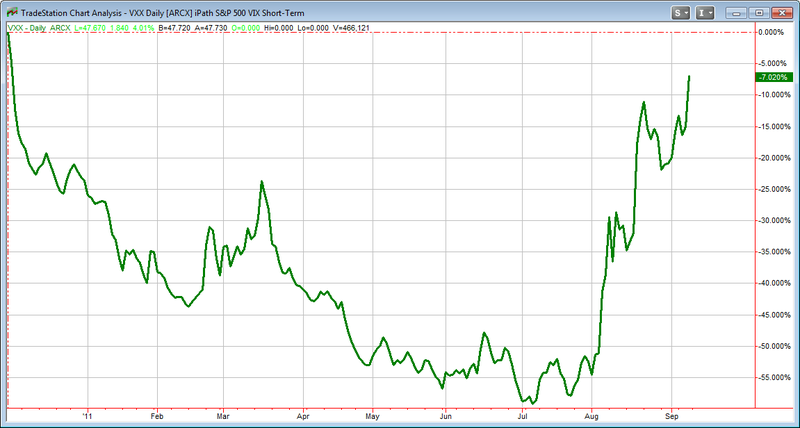 You may have noticed that SPY shows a gain of just over 1% here. The disparity between this 1% gain and the 0.25% gain shown on the overview page is primarily the dividends that had to be paid on short positions and the fact that it had to overcome a drawdown. Most of the time the "raw" returns here will understate the compounded results. That isn't the case this year for SPY. As you can see, EEM was the star in 2011. It has done extremely well over the last 5 years. This is the 3rd year in the last 5 that is has returned over 33%, and all 5 years it gained better than 12.5%. This isn’t typical, though. EEM has been an especially strong performer. The last few years I have shown the "Twas 3 Nights Before Christmas" study along with results for the SPX. It continues to do well. 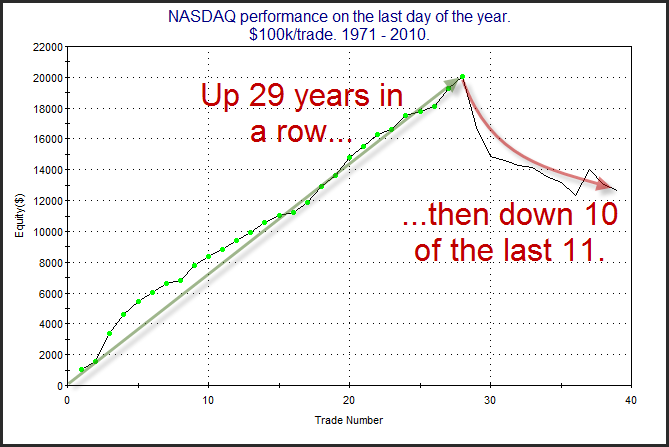 But this year I decided to show results for the Nasdaq Composite. As you'll see, the seasonality there has been even stronger and more reliable. 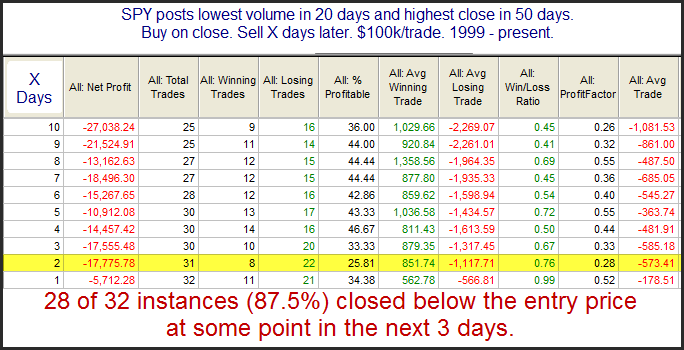 After seeing over 90% of the volume come to the downside on Monday, Tuesday registered a 90%+ upside volume day. 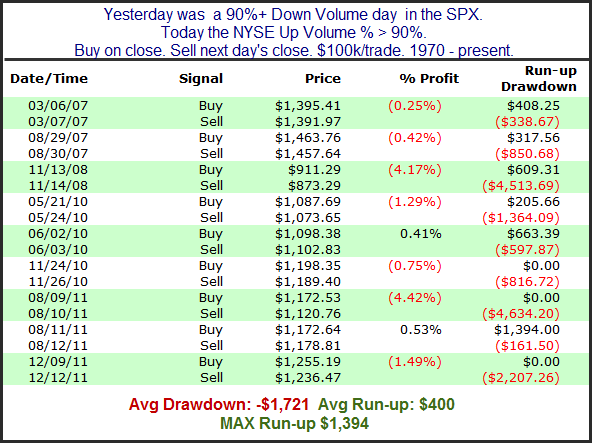 A 90% down followed by a 90% up day is something that was never seen from 1970 – 2006. But this is the 10th time we’ve seen it happen since the beginning of 2007. 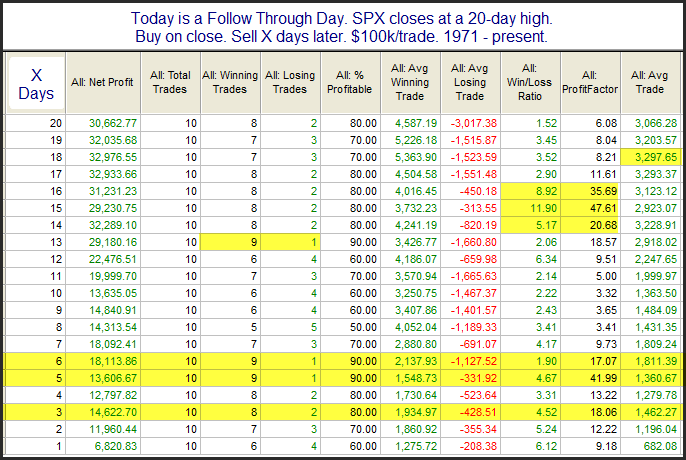 Below I have listed the previous 9 and shown how the SPX has fared the following day. 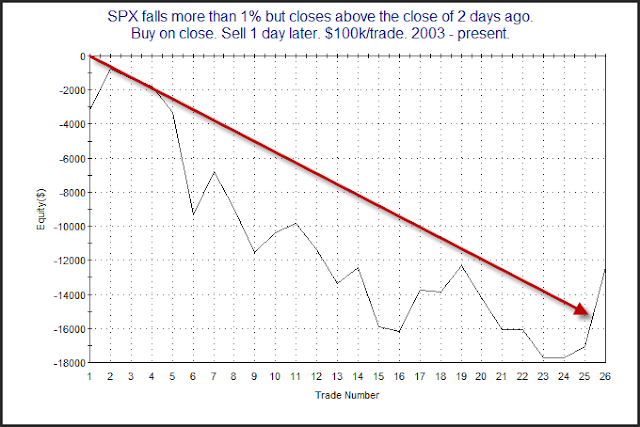 Though instances are low statistics at this point appear solidly bearish, suggesting a possible 1-day downside edge. 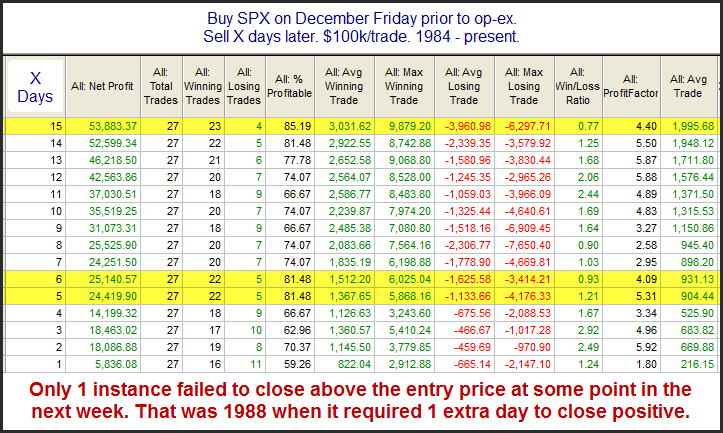 The high downside risk vs the small upside reward makes the results especially compelling for the bears. The Catpult trades have done very well over the years. Of those that received fills and were tracked in the letter over 72% were winners, the average trade made 3.35% and the profit factor has been an impressive 3.32. What has most attracted me to this strategy is not just the fact that it has made money, but WHEN. 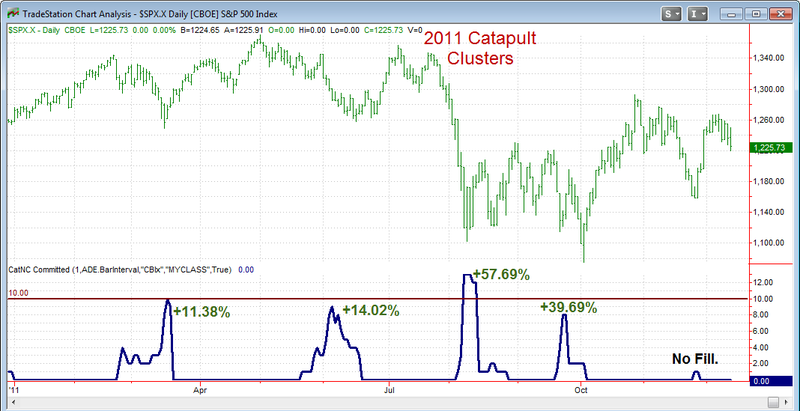 Catapults generally trigger when the market gets scary. They happen when other systems and techniques I employ have sometimes struggled. So they have not only made me money, but they've done so when other methods were losing. This was greatly useful in helping me to limit or avoid drawdowns. The timing of the trades can be seen in the chart below. The top of the chart shows the S&P 500. The indicator on the bottom is the CBI. 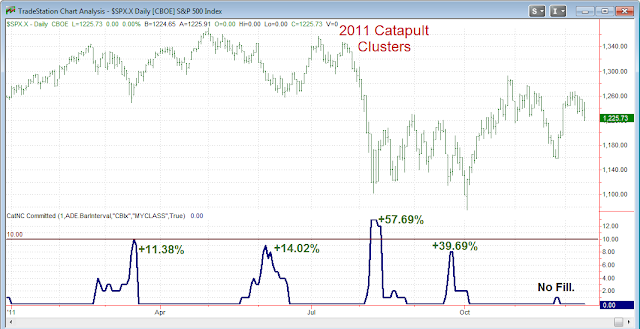 One way I track catapult trades is by "clusters". A cluster of trades begins when the CBI moves above zero and it ends when the CBI returns back to zero. Historically I found over 90% of clusters would have been net winners had you taken all the trades in the cluster with equal size. (The last cluster that had a net loss was about 2 ½ years ago.) Above each cluster in the chart is a number. That number shows the net additive gains that would've been generated by that particular cluster. One sector that is especially sensitive to Fed Days is the banking sector (BKX). BKX closed down on Monday about 2.5%. 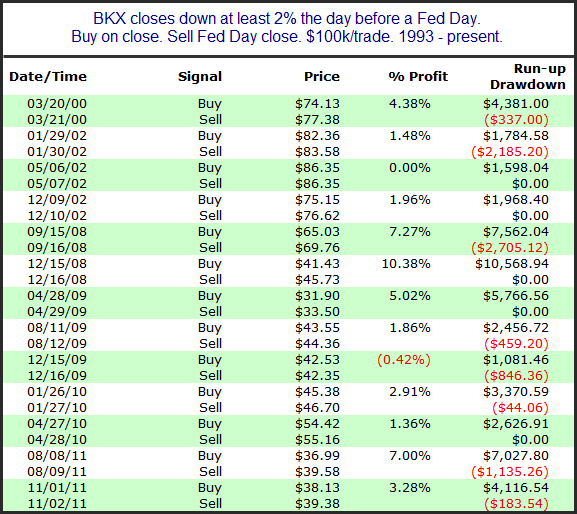 The study below looks at drops of 2% or more on the day before a Fed Day, and how the BKX responded on the Fed Day. Instances are a little low here but the stats are overwhelming. Below I have listed all instances. Not shown in all the above stats is that the average run-up was 4.2% and the average drawdown just -0.6% during the Fed Day. Overall risk/reward appears strongly favorable for BKX based on the limited sample size. The Mooost Wonderful Tiiiiiiime of the Yearrrrrrrrr! 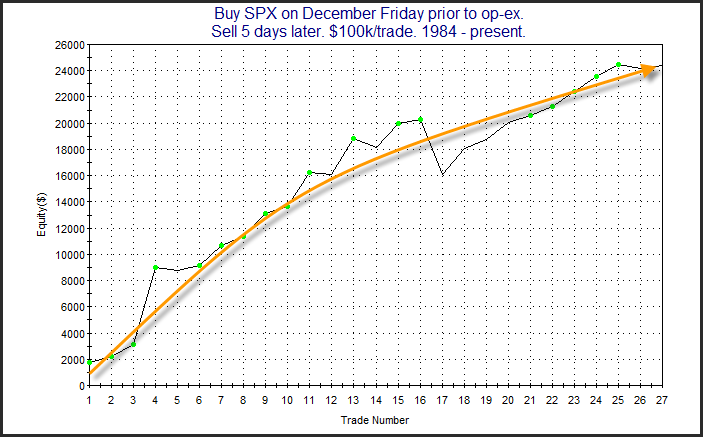 Over several time horizons op-ex week in December has been the most bullish week of the year for the SPX. The positive seasonality actually has persisted for up to 3 weeks. I demonstrated this most recently in the the blog exactly a year ago. I’ve updated that study below to include last year’s stats. The stats still appear extremely strong. I normally only show equity curves in my subscriber letter, but I'm in a good mood this morning, so below is a curve using a 5-day holding period. 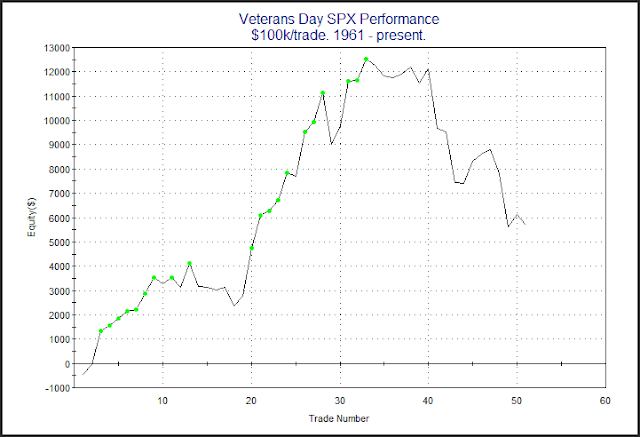 Aside from the big pullback in 2000, it has been a strong steady move higher. This would seem to confirm the bullish edge. 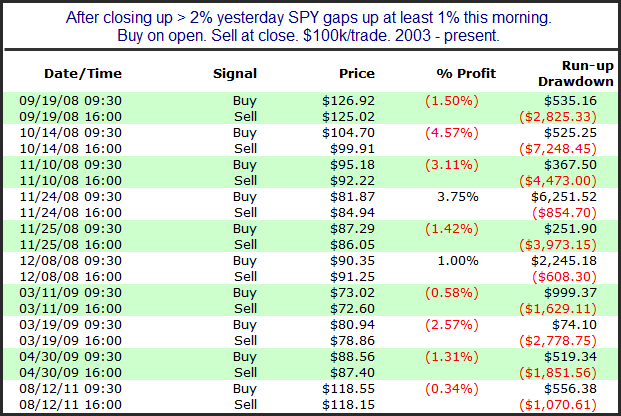 With SPY looking to gap up over 2.5% this morning below is a quick look at all other instances since 2003 when SPY gapped up over 2% immediately following a 20-day low. Low number of instances, but the suggestion is obvious. I would note, though that although they all finished higher, they also saw some substantial pullbacks from the opening price. 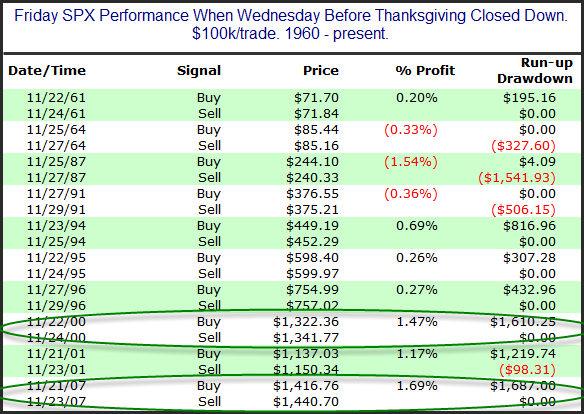 Thanksgiving has typically shown some pretty consistent seasonality. Both the Wednesday before and the Friday after have exhibited bullish tendencies while the Monday after has been slightly bearish. Last year I showed a table breaking it all down by day. Today I decided to show a profit curve that represents simply owning the SPX from Tuesday's close through Wednesday's close. I am at the excellent Las Vegas Traders Expo for the next few days. I plan on seeing several presentations and will be speaking myself on Saturday. I'd love to meet some blog readers, so please come introduce yourself if you see me. Monday’s extremely low volume could be a short-term bearish sign. The 0.96% drop did not quite qualify for this 2008 study, but below is another past study that does exemplify the low-volume issue. Rather than index volume, it uses SPY volume. Either one would yield similar results in this case. While not the most overwhelming edge we’ve ever seen, it does seem to strongly suggest that caution is warranted. 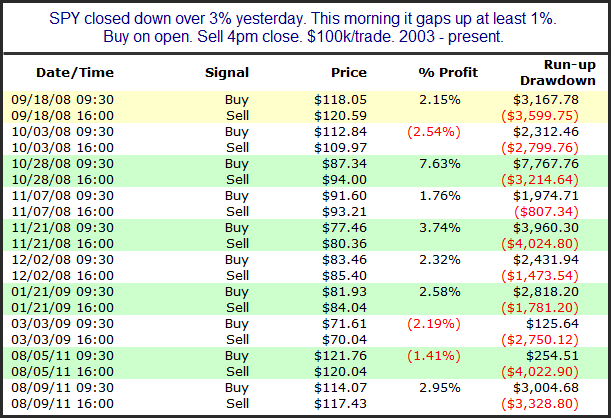 With the market set to gap up 1%+ this morning I decided to look at other times a 3% drop was followed by a 1% gap up. Below I have listed all 10 instances along with their intraday performance. Though the numbers don’t suggest a statistically significant edge, the early indications appear to suggest a tendency for further upside by the close. It is interesting that the avg run-up and avg drawdown are both about 2.8%. So traders could consider playing the intraday oscillations rather than taking a directional bet right off the bat. SPY failed to make either a higher high or a lower low than the day before. This is often referred to as an “inside day” because the range was completely inside the previous day’s range. In the past I have shown how inside days under the 200ma have often been followed by moves lower. 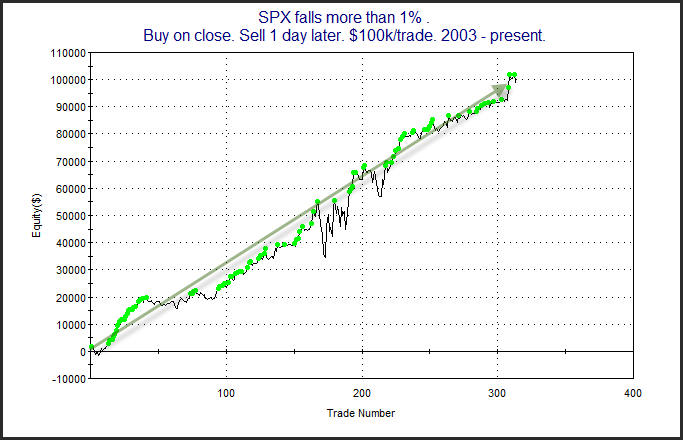 What’s interesting is that while that held true for a long time, since the bottom in 2009 it has not been the case. Let’s first look at an updated results table based on this setup. 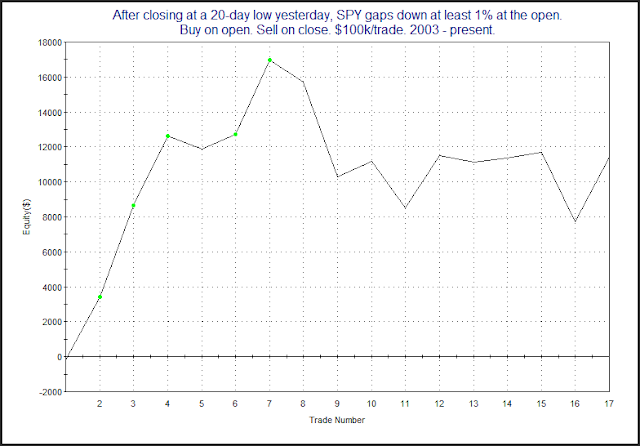 As you can see the statistics still appear bearish, with the downside edge basically playing out over the 1st 3 days. But now let’s take a look at the profit curve. 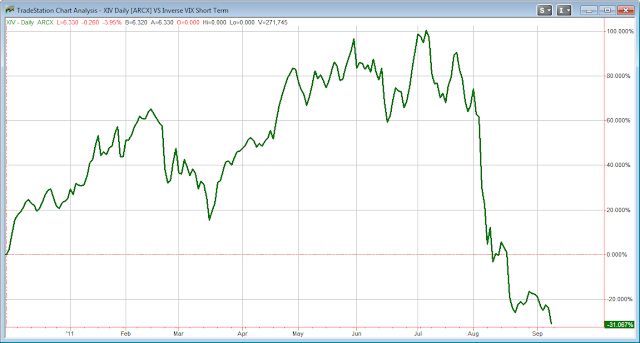 As you can see over the last two years (and 15 or so instances) the setup has not provided a downside edge. Both the 1-day and 2-day profit curves looked very similar to this. It is important to understand when historical instances provide a directional edge. But the market is always evolving. And sometimes setups that provided an edge for a long time will either stop working or will go a period of time without demonstrating the same tendency. It is important to monitor not only how has a setup performed over the long term, but also keep an eye on recent instances to ensure that edge is still being provided. In this case it doesn’t seem to be. 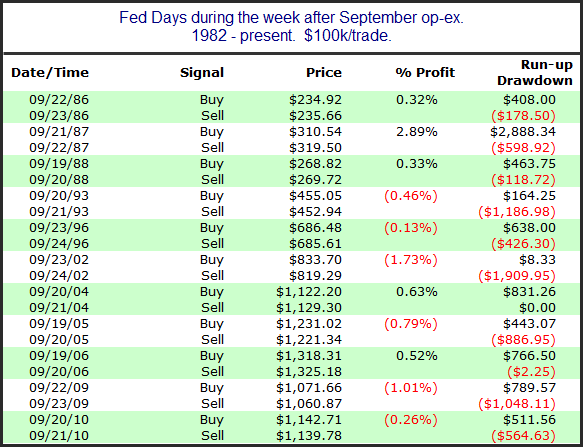 While Fed Days have historically provided an upside edge, that edge has been substantially more powerful when there has been strong selling the day before. The last time I showed this study on the blog was 4/28/10. I've updated the statistics below. Instances are a bit low, but they couldn’t get much more bullish. With a profit factor over 11 and the average trade about as positive as the worst trade was negative, risk/reward appears to heavily favor the bulls. This one looks very similar to the 20-day exit strategy. In this case the downside edge didn't begin to exert itself until the 1970s but it too has persisted lower for a long time. 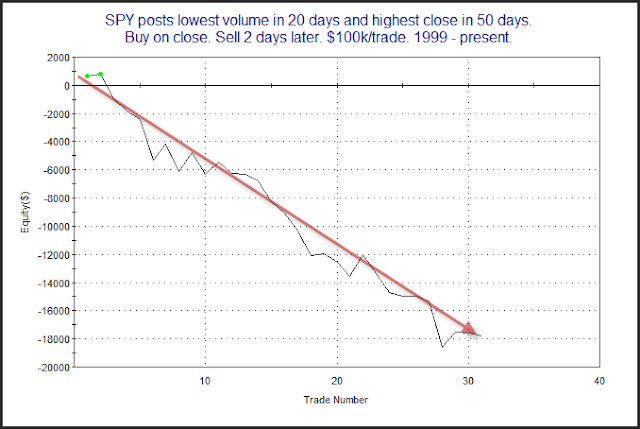 SPY volume came in at the lowest level in over a month on Monday. 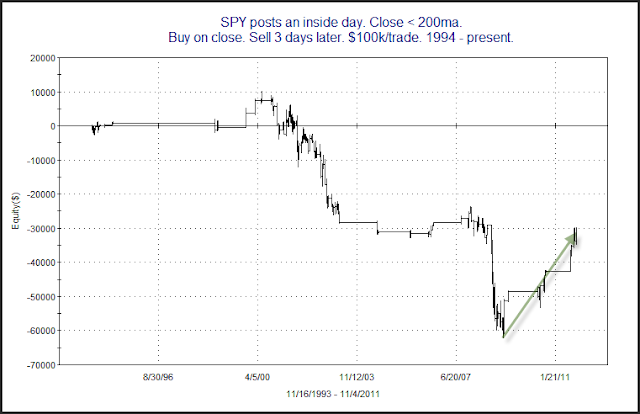 Very low SPY volume when the market is at or near highs is often a bearish sign. A few studies related to this appeared in the Quantifinder this evening. 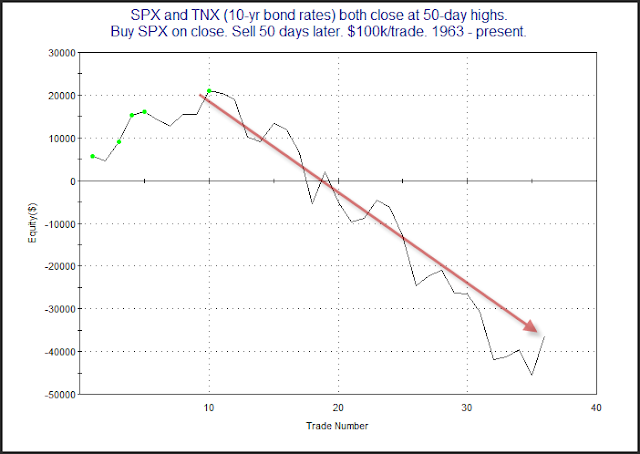 I decided to examine the combination of a 20-day low in volume combined with a 50-day high in price. Over the next 2 to 3 days there appears to be a solid downside edge based on the numbers. While I expected this to be the case, I was somewhat surprised to see that the edge persisted well beyond that. While I frequently show profit curves in the Subscriber Letter, I rarely do so on the blog. Today I decided to show it. So here it is using a 2-day holding period. The consistently down sloping curve appears as impressive as the numbers. I received a note the other day from a reader who asked why I have so many studies related to Follow Through Days (FTD) on the blog. The reader mentioned that the edges often provided by FTDs are not as compelling as many of my other studies. But one man’s trash is another man’s treasure. And while FTDs may not work as advertised and accurately predict new stock market rallies, they do a very nice job of defining the environment. A FTD tells us the market has undergone a correction. It tells us the market has made a multi-day move off the bottom. And it tells us that strong volume and price action have come into the market. Enthusiasm is picking up. We understand that the rally is only going to succeed about 40%-50% of the time based on the FTD, but we don’t need to know right away whether it is going to succeed or not to make good use of the information. While many of the past FTD studies on the blog and in the Subscriber Letter have focused on action on and around FTDs and what that might mean for the intermediate-term, it can also be useful to simply put the current day’s action in proper context so that we may better understand what that action may imply over the next few days and weeks. I use context in many other ways and people hardly notice anymore. Studies are always framed by where the market is. Is it above or below the 200ma? At a 20-day high? At a 20-day low? These are all helpful, but recent work has led me to believe that FTDs can be just as useful in defining context, if not more so. So I’ll continue to incorporate them and am optimistic that doing so may uncover some real gems. Anyway…we had a FTD Tuesday and then Wednesday the market sold off strongly. Strong enthusiasm has quickly turned. Let’s look at other instances and what has followed. The number of trades is a bit low, but the early indications appear to strongly favor another day of selling. Two things really strike me here. 1) There hasn’t been an instance in over 10 years. 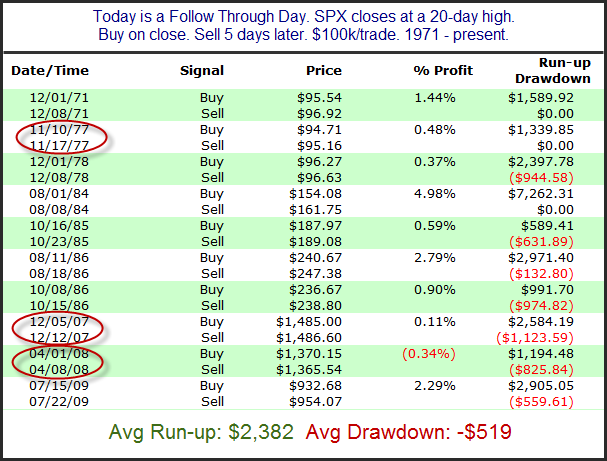 2) Run-up/drawdown is heavily skewed in favor of the bears. Overall I find these results compelling enough to take under consideration. One of the more amazing things I’ve noticed about the rally over the last 2 weeks is that it has come without any 1% Follow Through Day (FTD) on rising volume. Investors’ Business Daily first published and popularized the concept of the Follow Through Day (FTD). Though they have changed the definition slightly over the years, I have found their original definition to be useful in several studies. My tests go back to 1971, which was the inception of the Nasdaq, and also as far as some of my volume data goes. 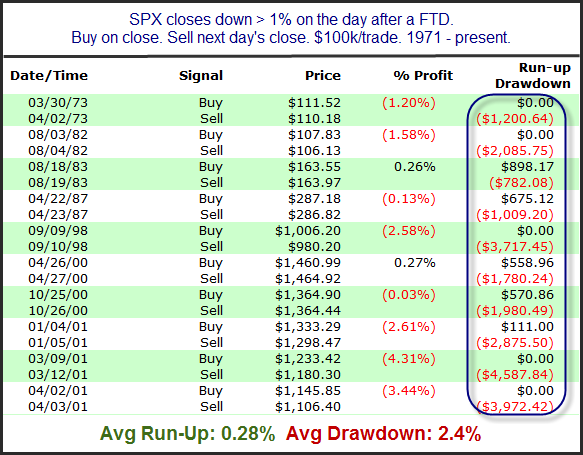 Since that time there has never been a rally that has taken the SPX from a drawdown of at least 8% to a new 50-day high that was not inclusive of a FTD – until Friday. This puts this rally in uncharted territory, which is always a little bit of an uncomfortable place for me. A FTD could still occur, and just because we have had a strong 9-day rally does not mean a bull market has already been missed. But one purpose of the FTD concept is to help in identifying market bottoms. If we are already at a 50-day high, then I would say this is one case where the FTD has let traders down in try to identify that bottom. Note: There was a 1% FTD in the Russell 2000 last week. I do not look at the Russell 2000 for FTD purposes. My studies have always looked at the Dow, Nasdaq, and SPX. The Nasdaq goes back to 1971, and I wanted to be sure to include that index initially. The Russell only has history back to the mid-80s. I feel consistency is important when testing and therefore I only look at those 3. IBD and others may sometimes look at additional indices. For consistency in testing, I don't. And this is the 1st rally where none of those 3 have registered the FTD before hitting a 50-day high. I’m starting to see a number of indications that the market is ripe for a pullback. One indication I noticed yesterday that will often suggest a pullback was the extremely tight range. Tight range can be a sign of indecision. When it occurs with the market extended upwards it can also imply the bulls are running out of gas and likely to step back for at least a short time. The study below demonstrates this concept. Much of the edge here is realized within the 1st 2 days. If the market is going to act on this signal and flounder it will often do so rather quickly. While the stock market is open on Monday, banks, schools, government offices, and the bond market are closed. 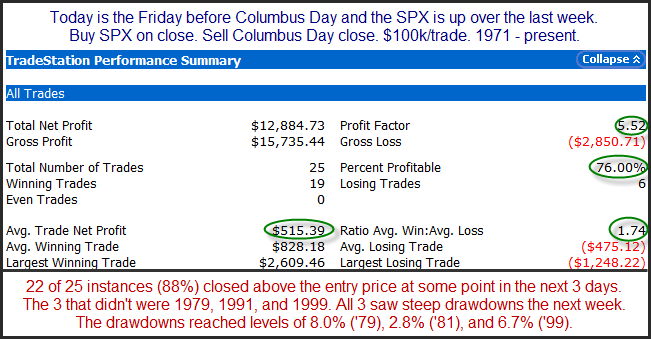 In past years with the bond market closed, the stock market has done quite well on Columbus Day. Of course the most famous Columbus Day rally was in 2008 when the market gained over 11% after having crashed the week before. Last year I showed that positive momentum leading up to Columbus Day has generally led to a positive Columbus Day. Columbus Day has been celebrated on the 2nd Monday of October since 1971. Below is an updated version of last year’s study. I’ve circled some of the more impressive stats here. 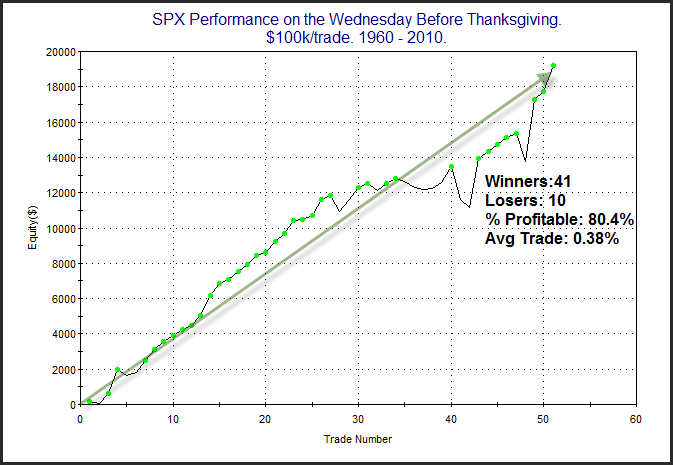 With 75% of trades profitable and winners nearly twice the size of losers risk/reward has been very favorable. Monday is the 1st trading day of the month. 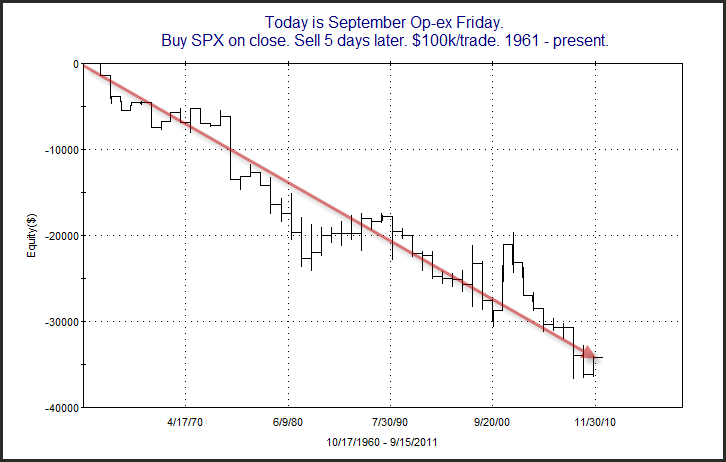 The 1st trading day of the month is renowned for having a bullish tendency, and this has been the case since the late 80s. 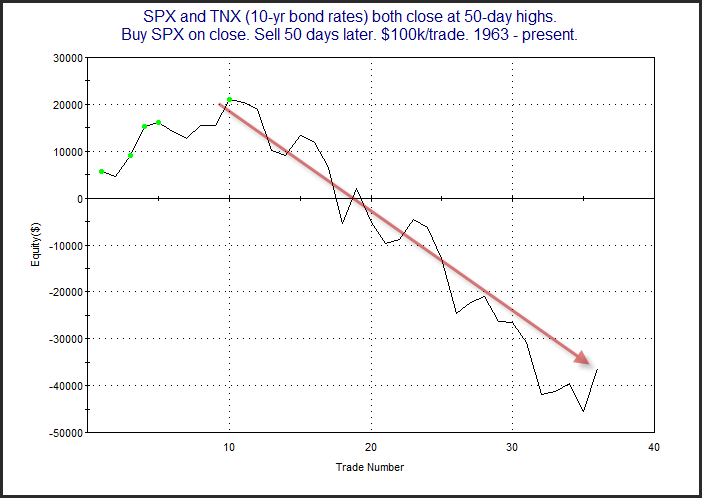 But this tendency has primarily played out during uptrending markets. During down times the 1st of the month has not been particularly bullish. This was illustrated quite nicely by my friend and fellow market analyst, Tom McClellan, in his “Chart in Focus” column on Friday. Using the 200ma as our measure of uptrend versus downtrend, I will demonstrate this concept numerically below. This first study shows results since 1988 of committing $100k per trade on the 1st of the month if the SPX is trading above its 200ma. The numbers all look very solid. About 2/3 of the trades were winners, and the winners were about 1.5 times the size of the losers, making for a profit factor of over 2.5. Next let’s look at times like now when the SPX is below its 200ma. The numbers here net out to a positive number, but just barely. It certainly doesn’t appear to be anything you would want to base a trade on.